The package containing these Onesies arrived by international courier (DHL) and the customs form stated clothing and toys which is very discreet. The best bit is the sender was merely listed as "Andrew" with no mention at all about OnesiesDownUnder which gives you peace of mind about how discreetly deliveries are handled as obviously when purchasing products like this you don't want branded packaging. Deliveries are always discreet from OnesiesDownUnder. You may have to pay some importation duties on them if ordering from the UK but this is hit and miss and will depend on the value of the order, so that is something to bear in mind. Having reviewed a few items of clothing now, I have an eye for detail and quality, and so I decided that I would focus on the quality, materials and construction of the onsies while Little Rae would concentrate on the design and comfort of them, which seems like a logical way to break down the reviewing process. The Onesies arrive individually wrapped in sealed plastic bags, neatly folded as you would expect. Upon opening the bags, I was immediately impressed by the softness and stretchiness of the fabric. There is a lot of giving and stretch in them which is perfect if you plan on wearing diapers (nappies) under your Onesie. The material used is 95% Cotton + 5% Spandex making for a light, comfortable layer that stretches and forms to your body. These Onesies feature a classic round neck design and the edges of the garment, neck, arms and around the leg area are all edged and very neatly stitched. This finishes these edges nicely and again I was impressed by the materials used. The four stainless steel pop studs used to secure the crotch are very strong, even to the point of sometimes being a pain to clip together if you are doing it yourself. But once popped in place they are definitely not going to accidentally come undone even if your little is a fidgeter in bed or while romping and playing on the floor. The wide crotch area is perfect for covering a diaper, and it is comfortable to wear which is great news for all of my ABDL readers out there. The generous sizing means that we could have got away with an XL for Little Rae even when she wears a diaper due to the stretchy nature of the material. So if you think you may need a size larger than you usually use if considering diaper wear then unless you are using a very thick diaper you don't need to worry as your Onesie will stretch around it. OnesiesDownUnder offer eight sizes in their Onesies and these run from XS to 4XL. Their website has an excellent sizing chart (Imperial sizes, so no metric measurements) that is very accurate and informative. It is probably one of the best sizing charts I have seen, and it certainly puts a lot of mainstream clothing sites to shame. At the time of writing this review, there are twenty-eight different choices of Onesie design at OnesiesDownUnder and these designs as shown in these pictures are also available on their fantastic Pacifier Clips and even their Bibs so you can create themed outfits or mix and match as you see fit. 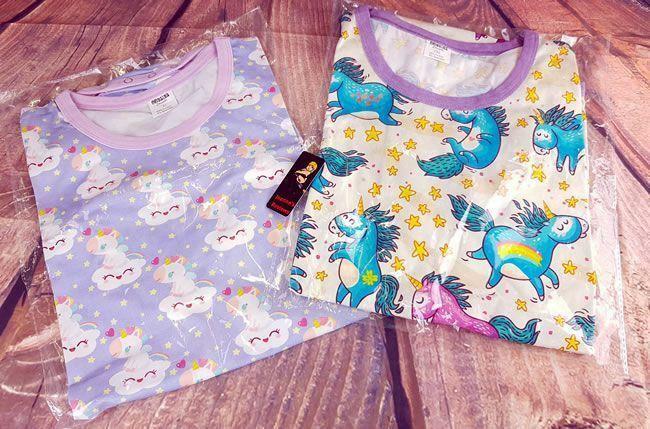 We were sent the Dreamy and the Unicorn designs and both feature unicorns - Yay! 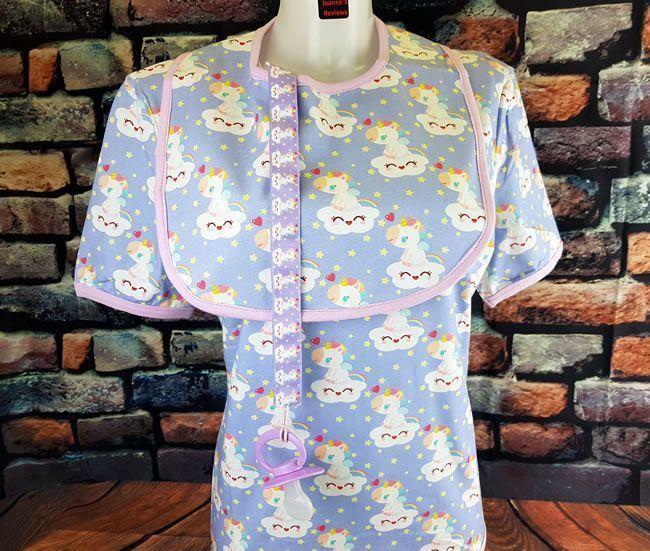 The Dreamy design has a unicorn atop a sleepy cloud and it looks fantastic with the same pattern repeated all over the Onesie. 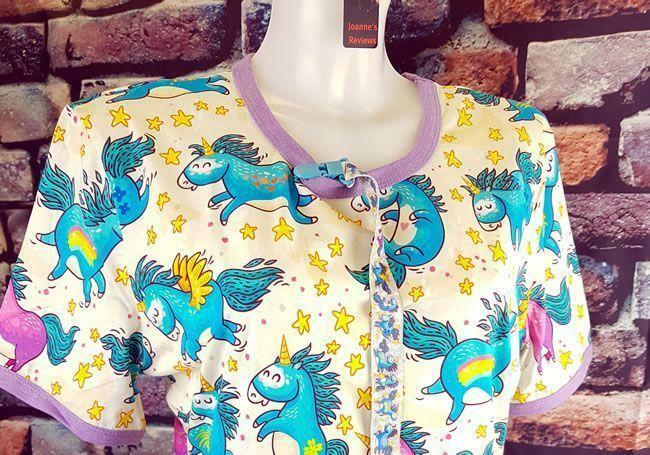 The Unicorn design features some of the cutest unicorns I have ever seen frolicking all over the Onesie in all sorts of funny poses, it is a firm favourite of mine just because of their excessive cuteness. They are washing machine friendly, and after a few washes, there is no sign of any colour fading at all. These Onesies are designed to not only look amazing, but they are also extremely comfortable to wear even for long periods of time due to their high cotton content. The pop studs make it easy to go to the toilet or have a nappy changed and also provide easy access if you are feeling naughty. The figure-hugging nature of these Onesies keeps them snug against your body meaning that you are not going to catch it on anything and it feels luxurious and extremely comfortable. Just simply wearing one of these can help put you into your little mindset as you can't help but feel cute in one. So what did Little Rae think of them? 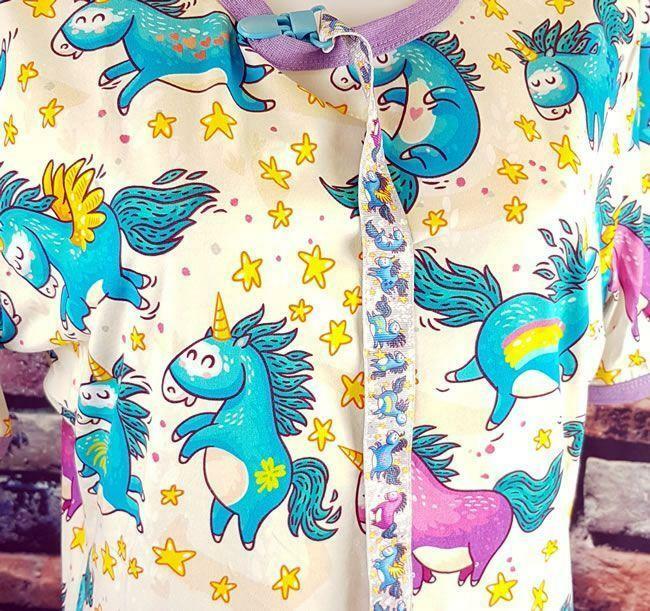 "I love my onesies, the unicorns on them are so cute it makes we want to squeal with excitement every time I see them. They are super comfortable to wear and having bare arms and legs help keep you cool. Playing in them is comfortable, and it is easy to unsnap the pop studs when I need to change or go to the loo. I love how soft and stretchy the material is and even when wearing a diaper they still fit me. The designs are incredibly vivid and bright, and I love the care and attention that went into making them. They are my favourite Onesies now, and everything that I have tried from OnesiesDownUnder has been fantastic. I wear mine for play sessions and also for sleeping in them, and they feel great, look great and make me feel very little while wearing them. They are ideal for anyone in a DDLG relationship." I was unable to get some photos of Little Rae in her onesies due to other commitments, but we will be doing an exclusive photoshoot in the future to add some adorable pictures of her in these Onesies to this review, in the meantime I have taken some screen grabs of her in them through the wonders of Skype. Doesn't she look so cute in them? Stay tuned for much better photos in a few weeks. These onesies exceeded our expectation in so many ways. The fantastic finish and materials make for a onesie that is both comfortable to wear and which is also very durable. All of the components are top quality, and the four pop studs are great, this is often a weak point in cheaper Chinese onesies bought through Amazon or e-Bay. With twenty-eight designs to choose from, there is a fantastic array of choices for any little, and these make fantastic presents from a carer, or they are a sweet treat for yourself. We are going to enjoy using these for a long time to come, and Little Rae loves her new onesies and gives them two thumbs up and a wink too. At only £22.61 each, they are excellent value for money as well. I was sent these Onesies by OnsiesDownUnder and I would like to thank them for giving me the opportunity to review it for them. Grab one or more of these amazing printed onesies from OnesiesDownUnder for just $39.95 AUD (£22.61) which is fantastic value for money. The range of designs in amazing with tewnty-eight different ones to choose from. Check out the fantastic designs of their Onesies, Tu-sies and Bibs as well. I have no problem in giving OnesiesDownUnder a huge thumbs up and a strong recommendation for anyone in the DDLG or ABDL scenes. Little Rae is delighted with them and that means I love them too.